The features of the Xioami Mi 5X, technical data, price, official photos, commercial mobile video and ratings. The Xiaomi Mi 5X is the first smartphone based firm debuts on Android 7.1.1 MIUI Nougat natively 9. 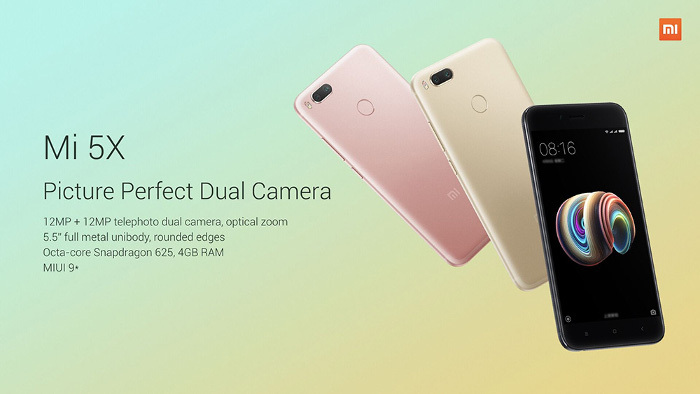 It is positioned within the mid range with a price close to 195 euros and its technical file includes as new features the double rear camera of the Xiaomi Mi 6. The Xiaomi Mi 5X screen is based on an IPS panel with LTPS technology. Its size is 5.5 inches and offers an FHD resolution of 1,920 x 1,080 pixels. The density of the panel rises to 403 dots per inch. Other details of interest of the display are the level of brightness, of 450 nits, and the layer of protective glass with 2.5D design. The chosen for the Xiaomi Mi 5X processor is a Qualcomm Snapdragon 625. The same is a SoC with 64-bit architecture and eight cores with a maximum frequency of up to 2.0 GHz. The interior also is a GPU Adreno 506 Can reach frequencies of up to 650 MHz. The memory section of the Xiaomi Mi 5X stands out by the introduction of a 64GB internal memory chip. However, it is possible to include additional micro SD cards to extend the smartphone's storage system. As far as RAM memory is concerned, the Xiaomi Mi 5X sports 4 GB of RAM. The camera of the Xiaomi Mi 5X is one of the most interesting points in the data sheet of the terminal. And it is that despite being well below the price of the Xiaomi Mi 6, Mi 5X has the same configuration dual rear camera with Sony IMX368 sensor of 12 megapixels. The point size is 1.25 microns and the optical group, consisting of five lenses, has a f / 2.2 aperture value. The second sensor has the telephoto function and features five-element optics and f / 2.6 aperture. The front camera features a five megapixel sensor with 1080p video recording and wide-angle lenses. The battery of the Xiaomi Mi 5X has a maximum capacity of up to 3,080 mAh. Wireless connections Xiaomi Mi 5X are distinguished as 4G connection, wireless dual-band ac, Bluetooth 4.2, assisted GPS with support for GLONASS and Beidou. The physical connection of Xiaomi Mi 5X is USB-C type and has a mini jack connection for headphones. The price of the Xiaomi Mi 5X for the version with 4 GB of RAM and 64 GB is 195 euros to the change in the Chinese market.